This report allows you to view the external connections of the User to the company’s internal resources (Mail, Skype for Business, SharePoint, Remote Desktop, VPN), and get detailed information about this connection by: IP, provider, country, application, internal server and resource (if available). The report shows data on the user’s previously created “white” – list of IP addresses (see “External connections”). Also, in the report is the ability to hide from the display the trusted IP of the country or providers, which makes it easier to analyze data and find suspicious connections. User activity is displayed in the form of bars located on the diagram. Each band corresponds to the connection depending on the type of grouping and changes its brightness depending on the number of requests per hour. When you click on any interval, you go to the report “External activity log”. 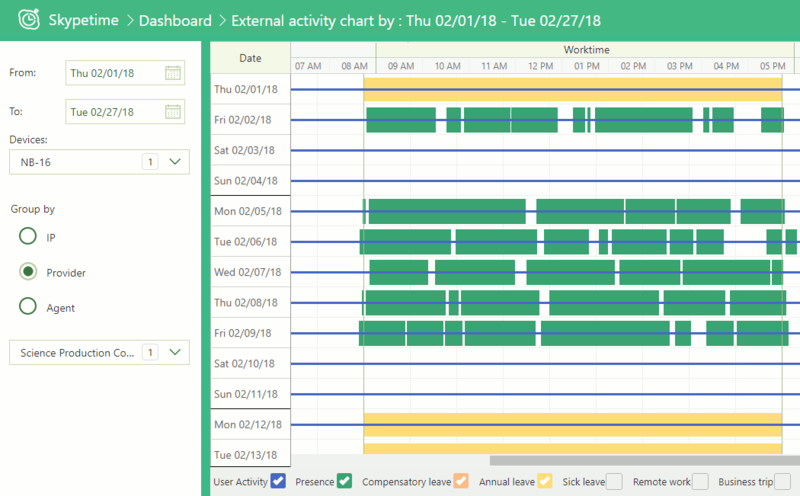 It is possible to schedule a connection on a schedule for the presence of an employee in the office for additional analysis, for this you should include the “Presence” mark in the report legend.